A fun and funky stilt cottage, lots of privacy and beautiful views. Fog Ducker Hollow, a fun and private stilt cottage located on the shores of scenic Cowichan Bay. This 2 Bedroom, 2 Bathroom cottage features a large sun deck, a private dock and a covered grilling/seating area offering lots of windows and many cozy spaces with amazing views of Cowichan Bay, Mount Tzouhalem and Salt Spring Island. Fog Ducker Hollow offers a great escape from the everyday. This fully furnished cottage offers all the amenities of home, allowing you to just rest and relax while watching the seals and otters swim playing in the bay. 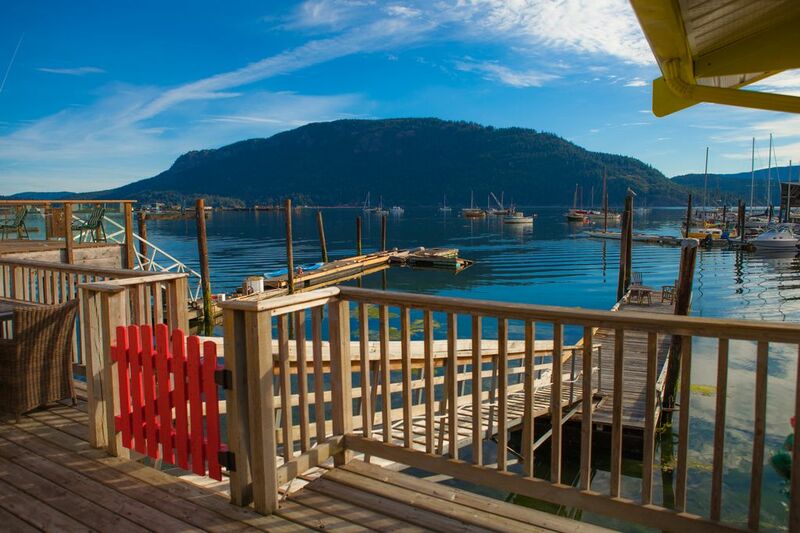 Located steps from the heart of Cowichan Bay, you can take a short stroll into the village and check out the maritime museum, rent a kayak for a paddle or sample some Vancouver Island Brews at one of the local pubs. While you are in town check out the local cheese shop, the artisan bakery or grab some food at the local market. The fully equipped kitchen and outdoor grill offers you the convenience of cooking a meal at your home away from home, or if you are worn out from your day of adventuring or just want a night away from the stove, sample some of the great restaurants Cowichan Bay and the surrounding area has to offer. The master bedroom offers a queen sized bed, small office area and a full en suite bath, enjoy your morning coffee in bed and enjoy the beautiful views of Cowichan Bay or enjoy the sunrise over Salt Spring Island. The Second bedroom located away from the main living offers a second television allowing you to sneak away for a movie or a nap on the queen sized bed. This bedroom is located adjacent to the other full bath. The layout of the cottage is optimal for maximum privacy inside, making it a great escape for anyone requiring 2 bedrooms located separately, a great set up for 2 couples or friends looking to vacation together and still get some down time. The living room features an operational glass wall (windows), a large screen TV, a natural gas fireplace and a large built in sectional seating area that could offer accommodation of an additional guest. The fully equipped galley style kitchen includes a dishwasher and natural gas stove, the kitchen opens to a covered patio and natural gas BBQ. The Large ocean facing sun deck offers spectacular views of Cowichan Bay, Mount Tzouhalem and Salt Spring Island. The deck is also equipped with a large Natural Gas Fire Bowl, offering a cozy environment to continue enjoying the sounds of the ocean as the sun sets. The Kitchen and Dining room are set up with dishes, utensils and seating to serve up to 6 people. Nestled on the edge of the seaside village of Cowichan Bay. Look out across Cowichan Bay and See Mount Tzouhalem on Vancouver Island as well as the peaks of Mount Maxwell on Saltspring Island. Stilt Cottage built over Cowichan Bay, with a large deck on the ocean side, leading down to a floating dock. A covered deck/grilling area facing the roadway. A second large open deck over the ocean facing ocean and mountain views this deck is also equipped with a natural gas fire bowl. This is our second time to this rental and we loved it both times. Jennifer has done a lot of upgrades since our last stay and it makes the place more enjoyable. Well stocked etc, relaxing sitting on the deck watching the boats, seaplanes etc. We will be back. Fog Ducker Hollow is a magical seaside oasis! The cottage is unassuming from the roadside, but takes your breath away upon entry. It is literally built over the water in beautiful Cowichan Bay and the views from both bedrooms and the living room are absolutely spectacular. The decor and ambiance of the cottage is truly charming with delightful artistic touches to be discovered in every room and outdoor space. We ate almost all our meals on the deck over the water - it really is the very best table in the village! The well stocked kitchen made meal preparation quick and easy and the nearby fish and chip restaurant (fabulous halibut and salmon) does take out too. There is a wonderful bakery and a cheese shop a short walk away too. We very much enjoyed our evenings sitting around the gas firepit on the deck, glass of wine in hand and the little boat lights twinkling nearby. Life on the marina was surprisingly quiet and peaceful despite the activity of the Kingfishers, seals and crabs going about their day, and the comings and goings of the boaters and kayakers in the Bay. We enjoyed a day wandering around the village and Marina and another fabulous day taking in a local winery tour - driver, tastings and lunch all included. We also tried stand up paddle boarding which was a lot of fun. Kayak rentals and tours are available steps away too. The views (and photos) from the deck are amazing - the early morning light dawning over the hills of Salt Spring and shining onto the Marina was spectacular and the golden glow of the evening sun on the water and boats was equally wonderful to witness. I highly recommend this delightful wee cottage in beautiful Cowichan Bay if you want a charming and unique experience in a lovely little seaside village. I could not imagine a better place to celebrate my milestone birthday and I treasure all my memories of our stay in Fog Ducker Hollow. This house is fantastic! Four of us stayed for four nights and could not have been happier with 1 - the location, 2- the cleanliness, 3 - the view. A lot of care has been taken to meet the needs of anyone. If the house didn't have it, you don't need it. I would stay again anytime. Thank you for your kind words, we are so happy you chose us for your island stay. Wonderful cottage with a great view! We thoroughly enjoyed our 2 weeks in this lovely cottage. It has all the amenities, and more; more roomy inside than one would know from seeing it from the street. Close to all the shops in Cowichan Bay village, and 10 minutes or so from Duncan and other grocery markets. The kitchen has great appliances, and more cooking tools than the average rental. Firepit on the deck, and perfect view of the harbour. Little touches like bath robes for guests were appreciated. Manager was helpful and accommodating. Would come back! We appreciate your kind words and are so happy that you enjoyed your stay. Thank you so much for your review. We would love for you to let us know what we could do in the future to make the experience a 5 star?